Scott Moe will be Saskatchewan's 15th premier after winning a leadership race that was too close to call until the very end. Of the 27,000 members eligible to vote, more than 17,000 of them — some of whom joined specifically to choose the new premier — cast ballots. 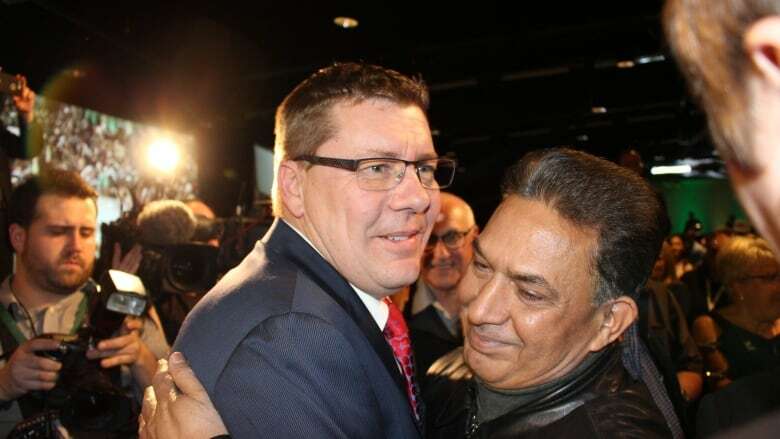 In the end, Moe, a former cabinet minister and rural MLA, was elected the new premier-designate with 8,075 votes —53.7% of the overall vote — at the leadership convention in Saskatoon on Saturday. It took five rounds of voting for Moe to be declared leader, finally knocking out former deputy minister Alanna Koch, who finished second with 6,914 votes. Ken Cheveldayoff finished third with 4,844 votes, Gord Wyant was fourth and Tina Beaudry-Mellor ended in fifth place. 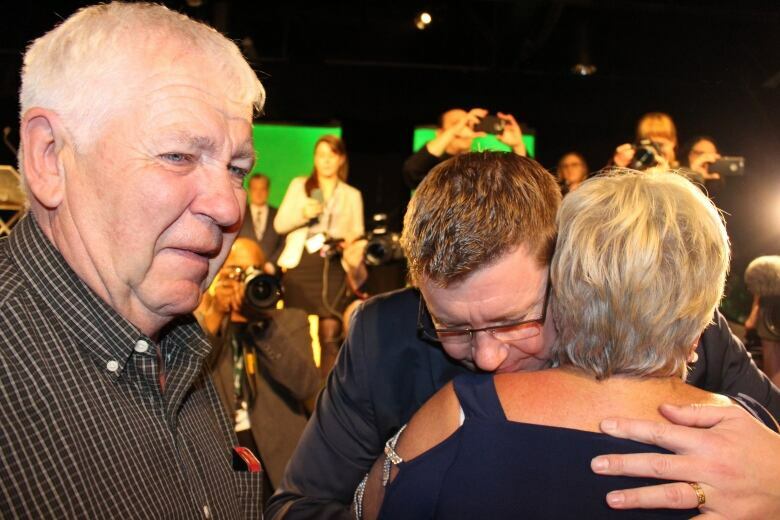 Moe sat quietly next to his wife the moment he was named premier designate by the party's executive director, his supporters erupting in cheers and surrounding him. Around a dozen MLAs lined up to congratulate Moe, who had the backing of 23 MLAs, including deputy premier Don Morgan, who endorsed him before his final candidate speech on Saturday. "Well, here we are," Moe said as his took the stage, which he walked onto the as the country song Homegrown by Zac Brown Band blasted from speakers. In his victory speech and speaking to reporters afterwards, Moe underlined his vision of sticking to Wall's plan to balancing the books within three years, as well as growing the province's population through export and trade, and supporting entrepreneurs. As the new leader, Moe said he plans to continue in the direction that made the party successful under Wall. He also plans to continue the fight Wall started against Prime Minister Justin Trudeau's carbon tax plan. "I will fight for this province. I will fight for our economy to ensure that we do not have a carbon tax," said Moe. "And Justin Trudeau, if you are wondering how far I will go: Just watch me," he told the crowd. Koch held a narrow lead over Moe until the fourth ballot when he collected second place votes from Wyant, then more from Cheveldayoff to win a majority in the fifth and final ballot. Cheveldayoff expressed disappointment in his loss, as did some supporters who gasped when he finished third on the first ballot. Koch, the only unelected candidate in the running, wouldn't commit to seeking election as an MLA, saying it's too early to say. She took a leave of absence from her post as deputy minister to the premier and also would not commit to returning to the job, if asked by the new premier. Moe, who has served as an MLA for Rosthern-Shellbrook since 2011, announced his bid for party leadership on Sept. 1. He has served as the minister of advanced education and prior to running, minister of environment. Moe has committed to balance the provincial budget by 2019 and vowed to bring back PST exemptions on crop, life and health insurance. During his campaign, he also announced his plan to funnel an additional $30 million to education funding. With respect to marijuana, Moe has said he feels the federal government has not given provinces enough time to meet the deadline set for summer 2018. The day Moe announced his campaign outside Saskatoon, 21 current MLAs were with him and had endorsed him. Since then, one additional MLA endorsed Moe, bringing the total to 22. Among those endorsing him are Bronwyn Eyre, minister of education, Donna Harpauer, minister of finance, and Dustin Duncan, who is the minister of environment and responsible for the Global Transportation Hub. Moe raised $225,265 through fundraising during his campaign. The NDP was quick to respond to news of Moe's victory with a statement both congratulating the premier-designate and predicting his leadership will be bad for the province. "It's going to be the same bad management and cruel and heartless cuts," said Saskatchewan NDP's interim leader Nicole Sarauer. She said Moe helped to write the party's controversial budget, including education cuts. The Federation of Sovereign Indigenous Nations also issued a statement Saturday night, saying it looks forward to meeting and working with the premier-designate. "We will continue to work towards the full implementation of our Treaty and inherent rights and we hope that our new premier works with us and not against us" said FSIN Chief Bobby Cameron.